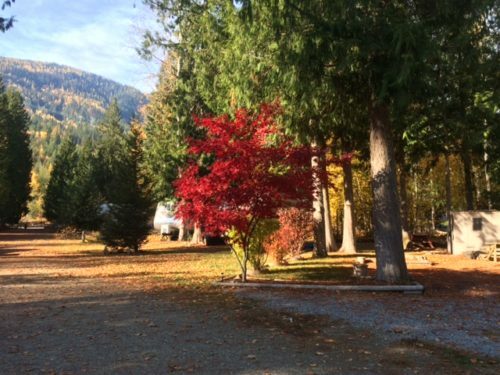 Many of the sites in the resort are owned by the members of the SFRVC (Shuswap Falls R.V. Club). We do offer overnight, weekly, monthly and seasonal rentals, however they are limited. 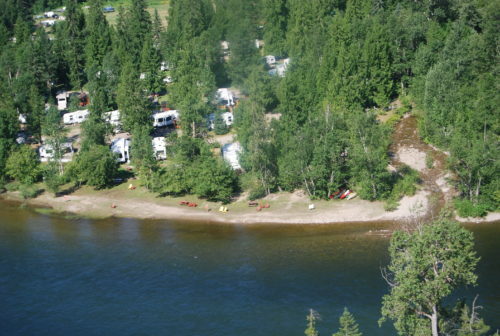 We have spacious RV sites with ample room for slides and canopies to open. You have your own space, giving you a somewhat private camping experience. There are showers/washrooms located in the center of the park and there are several pathways in the park giving you access to the river. You can chose from total sun, part sun/shade or total shade. Each site comes complete with a parking spot for a vehicle, a picnic table and fire pit. All of our sites are fully serviced with power (30 amp), water and sewer. Site sizes range from 50’ x 85’ to 60’ x 105’. All RV sites have full service: 30amp electricity, water, sewer, fire pit and picnic table. RV camping only, all RV’s must be self-contained (Black & Grey Water Holding Tanks only). Heated outdoor pool with patio. Open 10:00am to 8:00pm daily. That’s great! We can handle that too! Unfortunately the boat cannot be left at your site, however we do have lots of space for your “pride & joy” on the resort property. We are a pet friendly resort, and like all other resorts/campgrounds, we do have our policies. Pets to be on the leash at all times except in the off leash area and please clean up after your pet.